Vacations and trips can be an exciting thing to prepare for. And while you are preparing all the essentials your family will need, you certainly cannot forget about toddler travel beds. Although it is certainly possible to book hotel rooms with enough beds for everyone, this is often expensive so why not bring your own portable toddler bed. This saves money and gives you more choices when you are booking the accommodation. A toddler portable bed has been specially designed to make it super easy to travel with. These toddler travel beds are compact, comfortable and easy options to ensure you have a great sleeping environment for your child everywhere you go. Basically, a toddler travel bed is best described as being a portable bed for toddler use, one which doesn’t have high walls and doesn’t really do a lot to contain your toddler. However, you have to think of their restful sleep so you can be at ease at night too. Basically, this is a kids travel bed which can also be described as a fold up bed, and there are several different types to consider; one is an air mattress for toddler use, others are mattresses that fold straight out while others require assembly before use. Here we chose several of the best toddler travel beds your kiddo will love. Read, compare, and pick the one that suits you best. Fold ups are by far the easiest type of toddler bed to set up. In fact, you could probably have one unfolded by the time you have finished reading this sentence! But if only if only you could get your toddler to sleep that quickly! A huge advantage of fold up toddler beds is that they can be used anywhere. It is deal for children aged between 2-5 years, you can also use this particular bed for camping trips or sleepovers, as it is very easy to put up and down, and take with you – again, there is a matching travel case. Colour-wise, you can pick between blue or pink. The bed is made of a combination of steel and plastic, with a durable frame to hold weight, and canvas bed cover which is reinforced for extra strength – you can use this particular bed indoors or out. To open and close the bed, you simply snap it shut, and pull it open, safe in the knowledge that it is strong and clicks into place, whilst also being lightweight and easy to carry. If you have a toddler travel bed, the next best thing you can do is get a nap mat. This mat can be used on your foldable/inflatable bed or at home at any time. If you are not comfortable letting your child sleep in any bed or sheets you just set this mat up and you have a clean sleeping area. This inflatable toddler travel bed is one of the #1 parent’s choices because of its side bumpers included for safety. The air mattress is super-cozy. It is made of high-quality materials that feel natural and support the body like a real, soft mattress. This is an extremely durable travel bed, which can be used for sleepovers, camping trips, naps, and for on the go trips too. Easy to inflate and deflate, thanks to the included free hand pump, there is a support structure inside the bed which means that kids don’t roll out of bed in the night, onto the floor. Of course, there is also the option to remove the support from the material if you need to also. Weighing just 3lb, you can easily take this bed with you on many different trips, or it can be stored simply for sleepovers, the choice is yours. Fitting standard crib sheet size, this bed is easy to make up too, and the included carry bag means it is all very easy to take with you, without extra bulk. This is a ready bed which will allow younger children to feel support and safety. This is much more like a structured bed, which is great for little ones and has an integral headboard which gives extra support for your sleeping child. For younger children, this is a great way to help them feel settled and snug whilst on the move. This is an easily portable inflatable bed and bedding. It has an easy-to-use pump that inflates it in minutes. The Bear Hug Backpack is there to enable you an easy storage and transport. Best suited for 18 months – 3 years children. Pack contents: Inflatable bed with removable, washable cover, Pillow, and duvet, Bear Hug backpack for easy storage and pump. This foldable foam is one of the most comfortable portable beds you can buy for your child. It has a soft removable cover with a high-density foam to keep them lifted off the ground and dry. 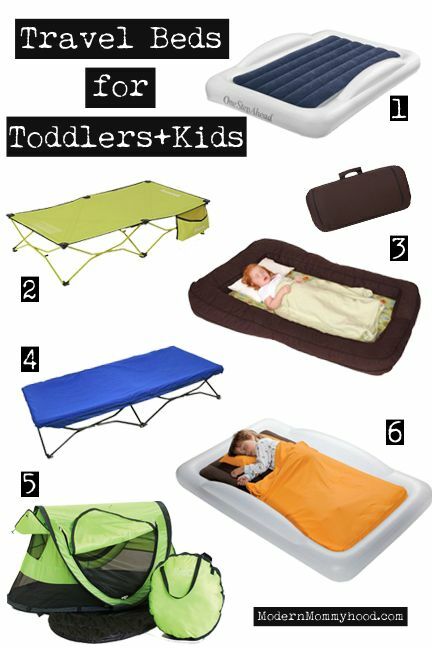 A perfect toddler traveling bed for camping, vacations, and sleepovers. You can even use it at home as infants grow up and transition from their baby beds. Bambino bed and electric pump fit in the included travel bag making it easy to take on an airplane or in a car. Travel beds are a popular option for traveling families, with The Shrunks Sleepover Kid’s travel bed being one of my favorites. The bed is an affordable option for families on a budget while still ensuring safety, comfort and easy assembling. This toddler bed is made of a natural and breathable material. Designed to fit the toddler travel bed and all crib sized mattresses. Hypoallergenic natural-fiber - You can rest assured your child will sleep safe and sound on this bed sheet, with its highest quality natural-fiber Tencel material. The Shrunks kids travel bed features a signature sheet-tuck that fits all standard twin sized sheets, trademarked security rails preventing your child rolling off. The bed is inflatable and inflates in just one minute. It is a larger option than the Shrunks bed above and instead of being for toddlers, it’s for kids aged 5-8. The bed includes a convenient carry bag, repair kit and a compact, powerful jetaire electric pump and is safe from phthalate, BPA and lead. Overall this is a great option for a travelling family. The Leachco Bumpzzz travel bed is a top travel bed not only due to its convenience but because it is one of the safest travel beds available, with soft padding, a large surface for playing and allergen-free foam. The bed is very easily assembled, it rolls out to form a comfortable bed, and can be folded in half to make a comfortable chair or play area for your child and folds up compactly making for simple transportation. The bed lies flat on the ground with raised cushioned sides and an indented center that ensures your child protection against rolling off. Overall the Leachco BumpZZZ Travel Bed is one of the best options for a travelling family ensuring comfort, safety and convenience. The Aero toddler bed is a fantastic choice for an inflatable toddler travel bed. Priced between $50-$100, this is a good investment and one which is long-lasting. The bed itself is made of heavy-duty PVC, with electronically welded seams, so you can be sure that this bed is going to last you for as long as you need it. The My First Ready Bed is designed for smaller children and has a bumper around the head area to keep kids within the bounds of the bed. What we love about this travel bed for toddlers is that it comes with a built in sleeping bag and the pillow area is slightly inflated. This means you don’t need to use any additional bedding! The sleeping bag is removable, washes easily and dries very quickly. It comes in a variety of prints. The carry bag is built into the mattress cover so you’ll never lose it. If you want to travel light then this is the best travel bed for toddlers. It’s important to consider the personality and activity level of your child before deciding which type of bed to go for. This Ready Bed comes in many prints and colors which will make them love it even more. However, you should consider the type of travel you’re thinking of enjoying, so you can pick a method that isn’t going to cause you a headache when you arrive at your destination, because this bed isn't suitable for airplane trips, but can fit in a larger car for the optimal comfort and safety of your little one. Good-quality, non-allergenic materials used ★★★★☆	 Great foldable bed on the go. Very convenient and easy to use. Made of non-allergenic materials ★★★☆☆ Perfect addition to have at any time, anywhere you travel with your little one. Hand pump and storage bag included ★★★★☆	 The removable mattress makes this toddler bed very convenient and easy to use. Pump included ★★★★★	 Very convenient and easy to use and store away. We liked the backpack that can be used for other occasions too. Incredibly soft and comfortable ★★★☆☆ It does add bulk, however it's a great addition to have in your home because of its super-softness. Fits into the travel bag for easy storage ★★★★★	 Very east to store away. We like the added bumpers for extra safety. Waterproof and lightweight, perfect to travel with ★★★★★	 Eco-friendly, great value for your money. High-quality materials and safety bumpers included. Washable cover ★★★★☆	 Very durable PVC material. Safety bumpers included and bedding. Offering the safety and comfort of a foam mattress ready bed, this one is inflatable - you can take that comfort traveling with you.